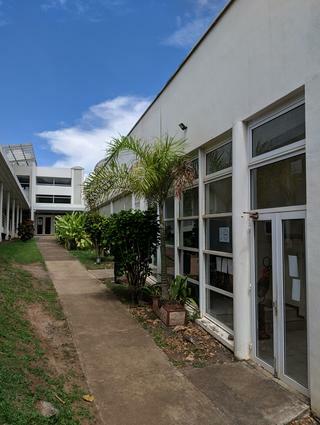 The GAATI offices on the campus of the University of French Polynesia. The GAATI group is the research component of the Department of Mathematics at the University of French Polynesia; it is additionally a research unit (EA 3893) of the French Ministry of Higher Education and Research. GAATI is the French acronym for Algebraic Geometry and Applications to Information Theory and reflects the research interests of the group. See the dedicated directory for high-resolution files and licensing information.